Rescuers always start out with the best of intentions. The plan is to help pigs. To save them from neglect, abuse, or abandonment. To find them a suitable home or provide lifetime care. Rescuers are people with a heart so huge they are willing to put their own life aside and dedicate themselves to the lives of others. This is a noble cause! Unfortunately, rescue life is far more difficult than most imagine. There isn’t enough money, there isn’t enough time, and there are too many pigs needing help. It’s easy to get in over your head or to lose sight of the initial goal. When you have more pigs than you can manage, more pigs than you can house, more pigs than you can clean up after, more pigs than you can feed, more pigs than you can trim hooves, more pigs than you can spay/neuter, then suddenly you aren’t rescuing them from neglect anymore. You are contributing to it. Please, always keep the pigs welfare in mind and only take on pigs that you can take comfortably care for. Getting in over your head does nothing but extend their suffering and put hardships on you. Follow the AMPA Rescue Codes of Ethics including spay and neuter all incoming pigs immediately. Spay and neuter is one of the most important things you will do for that pig. Do not take more pigs than you can manage on your own. This includes financial, feed, time, physical strength, housing, protected from weather, protected from predators, secure fencing, space per pig, transportation, temporary pens for incoming pigs, and extra space in case a previously adopted pig needs to come back. There have been lots of promises of help, support, and financial aid when rescuers start. Unfortunately, these all dry up sooner or later leaving the rescue to manage the responsibility on their own. Do not depend on others when the pigs are dependent on you. Absolutely, take all the help and support you can get, but don’t take in pigs unless you can manage them yourself when everyone else walks away. Keeps herds separate as needed. Keep intact pigs separated with extreme caution until they are spayed, neutered, then given two weeks to heal and level out hormones. Keep pregnant and newborn pigs separate from adult herds. If pigs have suffered from illness or surgery, keep them separated until they are strong and healthy. Do not allow the pigs to endanger each other. If you have multiple underweight pigs, keep those separate from the other pigs to ensure they are able to get plenty to eat without having to fight for it. Maintain healthy weight with proper nutrition. If you cannot afford to feed the pig properly then do not take him in. Pigs do not deserve to be underweight or overweight. Both conditions are painful and detrimental to their health. Keep elderly or special needs pigs separate from young robust pigs. If pigs are morbidly obese and fat blind, give them a safe place to diet until they are at a healthy weight. Quarantine incoming pigs to avoid exposing your current pigs to potential disease or harm. Check for a microchip. There may be a rescue, a breeder, or an owner that has promised this pig safety and comfort for a lifetime. 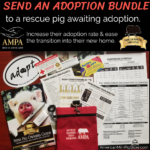 AMPA breeders & AMPA registered rescues (coming soon) have all agreed to take back any of their pigs at any time for any reason. Do not assume the pig’s current situation is due to the breeder or rescue. Unfortunately, even with the most throughout screening, contracts, and communication, some owners will rehome the pig on their own without consent or communication to the breeder or rescue. From that point on, nobody is looking out for that pig and he may be shuffled to several homes before finding his way to your rescue. If a breeder or rescue has promised responsibility to this pig, give them a chance to make good on that promise. Adopt out adoptable pigs. While it may feel noble to want to save and protect all the pigs, the reality is a sanctuary does not provide the same quality of life that a dedicated & educated home does. Unless the pig is unadoptable for health or behavior reasons, all pigs should be adopted out to approved homes in a timely manner. Screen, Screen, Screen!!! Screen adoptive homes thoroughly! To protect the pigs you bring into your care, you must ensure the homes you are placing them in are just as responsible and dedicated. Use a thorough adoption application and adoption contract. Visit their home. Meet the family, talk with them in person, and check out the area where the pig will live. Unfortunately, many people will lie. It is your job to sift through the lies and fabrications to ensure the pig will be placed permanently with the care and love he deserves. Be honest and open, always. Show pictures of the pigs condition when they come into your rescue. Show pictures of their condition when they leave. Announce adoptions. Ask for help when it’s needed. If you are operating properly with the pig’s best interest as the priority, then you have nothing to hide. So…. hide nothing.